Good novels do not necessarily make good plays. No Great Mischief, David Young’s adaptation of Alastair MacLeod’s acclaimed 1999 novel of that name proves the point. One sits and admires the spare, beautiful design, the fine acting, the creativity of the direction without once being drawn into the story emotionally or intellectually. The main problem is a lack of focus. The novel’s presents the internal ruminations of Alexander MacDonald about his destitute, alcoholic brother and their family history. “What makes Alexander (RH Thomson) visit Calum (David Fox) every week?” should be the central question, but the brothers’ relationship is overwhelmed by the livelier staging of various events of the MacDonald family’s past from their departure from Scotland to their lives on Cape Breton Island. Young is trying to capture the idea of a chaos theory of biography (mentioned in the play), where even minute events have unexpectedly major repercussions, but the result is a series of isolated episodes lacking any dramatic tension or forward thrust. Director Richard Rose does not help matters by staging these episodes, from storms on the ice to underground mining, as unconnected theatrical set pieces--each inventive in its own way, but having no cumulative effect. Alexander’s Grandma (Nancy Palk) frequently dispenses platitudes like “Always look after your blood” and “Remember your own history”, that the play accepts uncritically. Thomson and Palk are very effective but the most exciting performance comes from Fox, who must alternate between the aged Calum in varying states of drunken degeneration and his vigorous younger self at several different ages. Unfortunately, the other four members of the cast never reach the same level of subtlety as these three. MacLeod’s novel is such a quick read, time might be better spent with it than with Young’s disjointed reflection of it. Note: A version of this review appeared in Eye Weekly 2004-11-18. Photo: David Fox, R.H. Thomson and Jody Richardson. 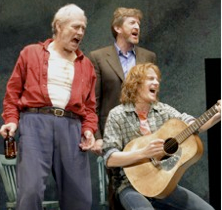 ©2004 Tarragon Theatre.